Sunday 1 July is Canada Day. We are very grateful to Canadian benefactors of the College of St George who are supporting the soon to begin works in the Dean’s Cloister. 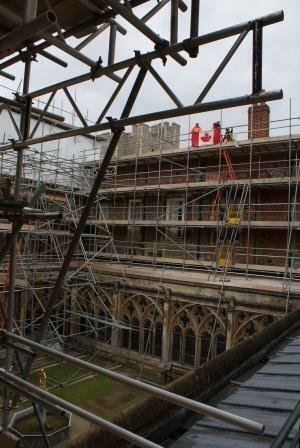 Denese Webb of Paul Webb Roofing together with Ian and Sam Dawson of Dawson’s Steeplejacks (surveying the Cloister for the lightening protection upgrade which will follow on completion of masonry works) are seen holding the Maple leaf aloft over the Cloister.